Priamo is Patty's first cria. This guy's grandsire is the 2003 National Reserve Grand Heavy Wool male and his sire is the top show llama in the nation. His fiber is like silk and he is very square. Recently he has begun his obstacle work and is progressing nicely. We have decided that he does not have herdsire potential. He is a very cute and small guy, which would be great for obstacle work. He is a wonderful mix of North American and Chilean lines with no linebreeding. After a 400 to the day pregnancy, Normandie birthed this beautiful and large female. Venicia has extreme heavy bone and massive structure. At one day old she was already a half foot taller than our month old cria. She is showing great promise as a performance girl and does basic obstacles. Additionally, we realize now with Niki's new fiber judge training that this girl has AMAZING fiber. Normandie's offspring are some of our most asked about animals in our herd. Her sons and daughters are producing in Australia and across the United States. There is no linebreeding in this cria, she is a highbred of English, Peruvian and North American lines. Both of her full siblings are in breeding programs already and are LOVED! *Venicia has numerous novice performance wins too! What can we say, we wish he was ours? This male is stunning, perfect and very level headed. He isn't for sale, but boy is he fun to look at! The crossing of our two very best bloodlines. Peruvian/North American lines all wrapped up in one AWESOME package! His sire is an ALSA Halter Champion who is still winning in halter at age 10. 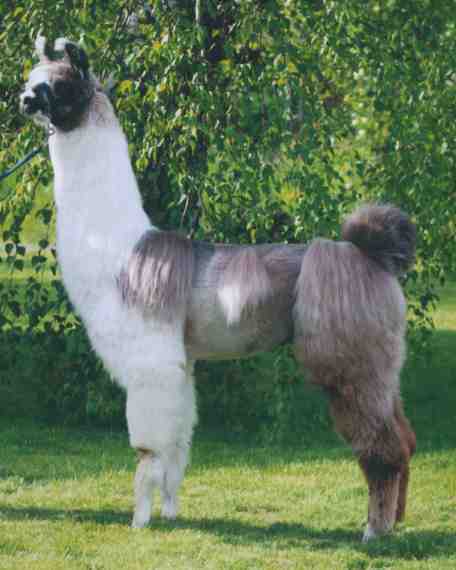 Grandsire is the top show llama in the nation. 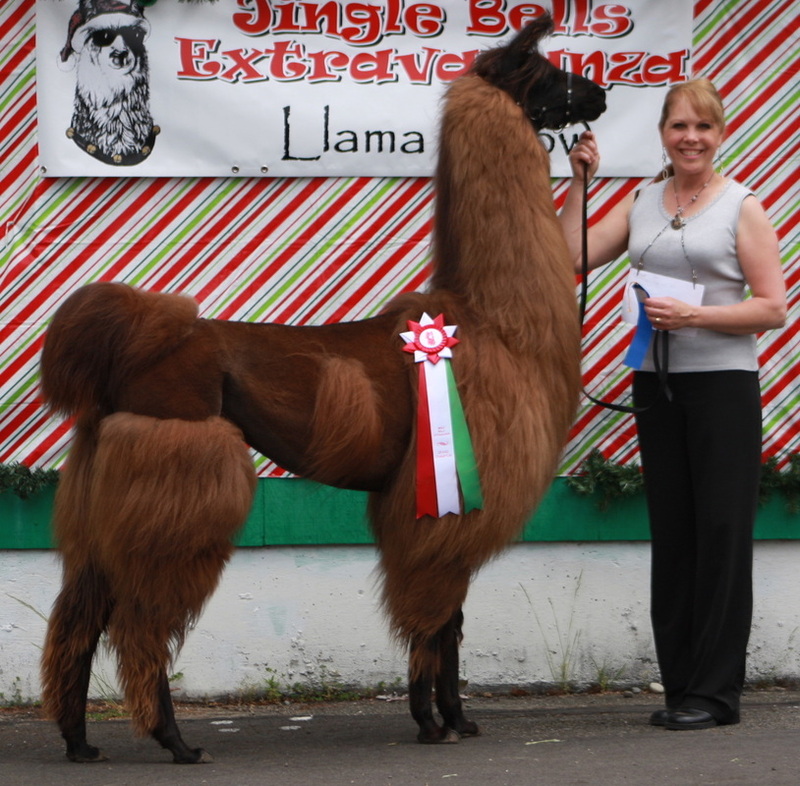 Both Grandsire and sire are/were Delta Society Therapy Llamas too! Kahneeta is a classic female with a nice short coat, characteristic of these wonderful proven packing lines. She is a beautiful shiny white and long legged. Her mother is our National Reserve Grand Light Wool female and dad is our proven super pack male that is an ALSA Halter Champion and PLTA Master Packer. Kahkneeta is a star at obstacles already and has fun written all over her! She should have come out of the womb with a pack on given her strong packing lineage.